A large cloisonné enamel vase of baluster shape, the flared sides rising from a domed foot. 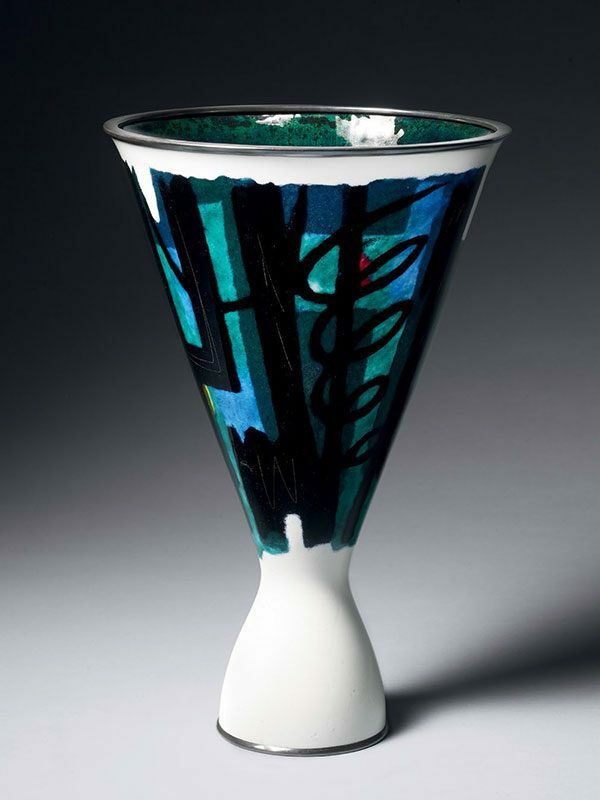 The base section of the vase is covered in plain white enamel, the sides are decorated in blue, black, green, red and yellow enamel on a white ground with an abstract pattern, consisting of lines and twirls. The flat rim and the foot rim are covered in silver, the interior of the vase is enamelled green andblue. The slightly recessed base is enamelled with the two-character seal of Ota Hiroaki. The vase is contained within the original wood tomobako, which is inscribed Shippo kabin, Hiroaki saku (cloisonné vase, made by Hiroaki). Ota Hiroaki (1913 – 1991) was born in Nagoya City, Aichi prefecture. He is considered one of the leading cloisonné artists of the Showa Period. He participated frequently in the Nitten exhibitions. His works were introduced in a book entitled Showa no kyosho sakuhinshu (the works of cloisonné art by the masters of the Showa Period), published by the Japan Cloisonné Artists Association (Nihon Shippo sakka kyokai) in 2000. Ota Hiroaki is the third generation of an enamelling family. His father, Ota Yoshisaburo, worked during the Meiji period, was also based in Nagoya and won an award for his work at the 1889 Paris Exposition.